– It’s only people like you, tourists, who come here. The owner of the small paper shop at Jor Bagh market in Delhi both looked and sounded defeated. – Well there are some foreigners in the area, they also come to shop here. But it shone through, clients were not in abundance. I almost missed it, the Four Seasons Gallery, as I was looking for the rather more famous JorBagh bookshop. I was walking through the arcade when I by chance spotted handmade paper in the corner of my eye, something that I rarely miss. I had never thought of finding a shop like this among the line of rather prosaic shops. 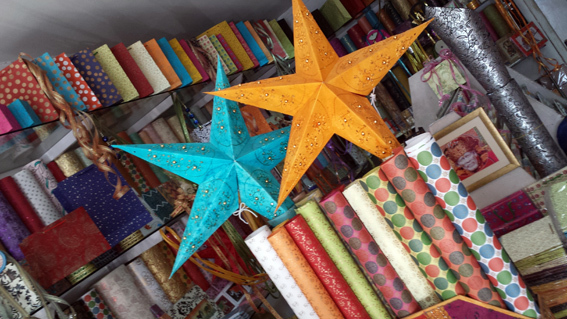 Beautiful stars and wrapping paper…. The Four Seasons Gallery, it’s tiny but colourful although a bit modest from the outside. The walls were lined with paper and paper products of all sorts. 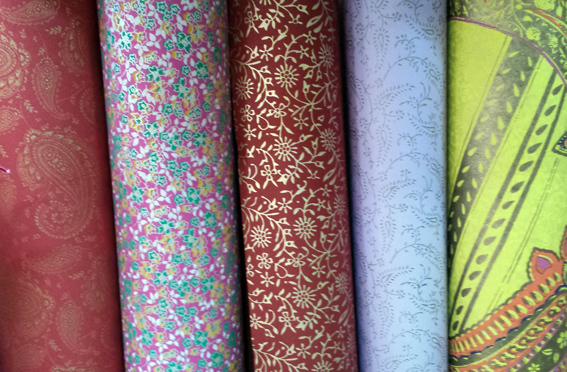 For a paper maniac, the shop was a small gem and I instinctly thought of my luggage (space being a key word…). As Christmas was only two months away, the many beautiful stars dominated the shelves. 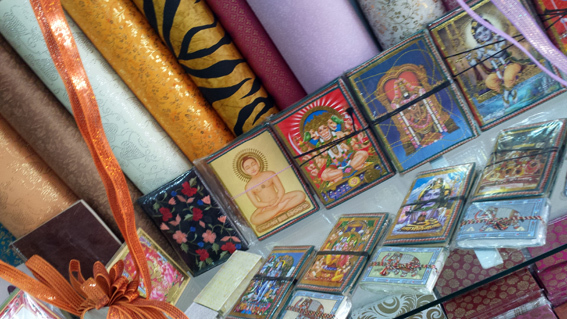 Along with cards, note books, wrapping paper, albums, writing paper – everything in awesome colurs and patterns; from the beautifully ornamented elephants to more modern varieties. This handmade paper doesn’t crease in you suitcase. It almost behaves like fabric. Sadly, paper is losing terrain these days. Although it might have happened once or twice, I never send birthday or Christmas wishes by SMS. I cannot think of anything more impersonal. I look upon it as an easy way out, but I realize I’m getting old fashioned. But people always say they treasure getting letters and cards sent by “snail mail”, and I will keep sending them so that I can come back to Jor Bagh and re-stock my own shelves. If you should happen to be in Delhi, or in the area, the address is 13/4 Jor Bagh Market. It’s worth stopping by! wow!! Are these really wrapping papers? Those patterns and colors make them look like fabric. Beautiful it is! Visited the above mentioned store when i was in India. Was impressed by the choices available. 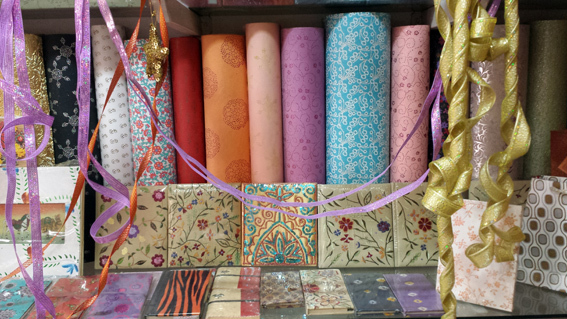 Another store in Khan Market called Anand Stationers has the same concept but much more products. True. Anand Stationers is another great shop! Love it!